Have you noticed that the piece of furniture you love so much for sentimental reasons doesn’t really work for your décor anymore? If you have a treasured furniture piece that you want to give renewed life, consider reupholstering as a way to integrate the piece into your current décor and fix the issue. Is reupholstering furniture worth it? Price isn’t the only consideration when deciding whether or not to reupholster a furniture piece – there are many factors to weigh in making your decision such as its sentimental value, age, style, condition of the piece, what you hope to achieve in reupholstering, and how the furniture will be used after it is redone. Obviously, if it’s a treasured heirloom intended to be passed down through your family for generations to come, it’s worth investing the time and money to ensure a piece of family history is preserved. Is the item sturdy or made from hardwood? If so, it is likely a high-quality piece that can last many more years. If the furniture has down filling, it can be very expensive to reupholster – while couches and chairs with foam padding tend to be cheaply made and not worth the price of reupholstering. Ultimately, the decision to reupholster hinges on how much you love the piece. If it has a style that you can’t find elsewhere, or if it has sentimental value, reupholstering makes perfect sense. How much does it cost to reupholster a piece of furniture? The cost of reupholstering varies greatly depending on the size and style of the piece, as well as the type of fabric you select for the project. Fabric alone can range from $10 to $40 per yard – or more if you choose a rare type of fabric that is difficult to work with or requires special care. According to HomeAdvisor.com, the price for reupholstering ranges from $140 to $1,600, with the national average being $650. If you live in a metropolitan area, expect to pay on the high end. If the furniture requires frame repair, it will also add to these estimates. How do you choose the right fabric for your reupholster project? Pattern or solid? Leather or fabric? Something bold or something neutral and subtle? Consider where in your home the newly updated furniture will be used and integrate what the room needs in terms of texture or a pop of color. If you want to play it on the safe side, it’s easier to reupholster in a neutral shade and add color with pillows and throws. Or, choose a neutral hue for most of the piece and then add a bold trim. If you have children or pets, it’s best to choose a durable fabric that is easy to clean. If the piece is for a room that is your private oasis, go bold with a bright color or choose something luxuriously cozy like velvet. Reupholstering is an investment, so whether you choose a classic fabric like linen or cotton or something more daring, try to pick something you will enjoy for an extended period of time. Design the piece for how you and your family live day to day so that you won’t constantly worry about the furniture piece being ruined. How do you reupholster furniture? Whether you are a do-it-yourself type or a professional, the basic process of reupholstering is the same. First, all current fabric must be removed from the furniture piece. It’s important to be meticulous in removing all staples and nails. After the piece is completely stripped, inspect for any structural damage. If any defects are found they must be repaired – for example, if a chair leg is wobbly, tighten it. Or if a piece of wood on the frame is deteriorating, it should be replaced with new wood of the same size. Next, clean the piece. If any wood requires staining, this is the next step. Cut your fabric and attach to the frame. Some fabric pieces, such as the arm covers, may require sewing. 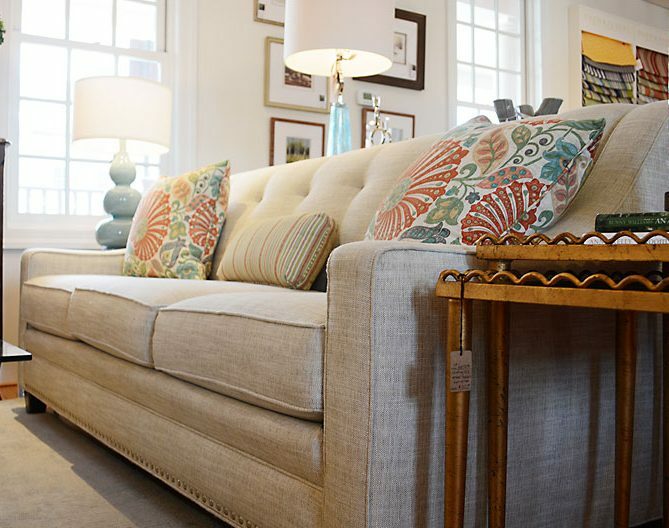 Add any finishing touches, like tufting or nailhead trim, and your furniture piece is renewed! At The Guest Room, our designers can first help you weigh the options to decide if it makes sense to reupholster your furniture. Then, we will help you find just the right fabric to blend with the style of the piece and integrate it with your current décor.